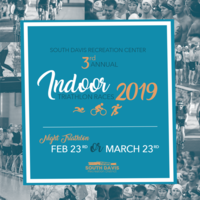 The South Davis Recreation Center will be hosting our Indoor Night Triathlon on February 23rd, 2019. We are excited to open this event up to 90 participants who will be doing a timed version of the sport of triathlon. We will start with a 15 min swim, 10 minute transition, 25 min indoor bike on our spin bikes, 5 minute transition, and finish with a 20 minute run on the indoor track. This is a perfect opportunity to get an early jump on the sport of Triathlon and can serve as a gage, moving into the 2019 Race Season. We are excited to host this event and hope that our triathletes will take advantage of this opportunity to compete in the indoor setting of our Facility. Cost: $25 until January 6th then $30 with registration closing on Feb 20th @ 11:59 p.m. The participant who goes the greatest distance in a particular leg receives 100 points for that leg. All other participants will receive a percentage of those points based on their distance traveled in that leg. Each leg of the race counts equally towards the total score. *winners will be overall in female and male 1st-3rd with the award being a comped entry into any 2019 race through our recreation facility.